Experiments are centered on the investigation of questions pertaining to the relationship between energy, biomass, number of levels, and number of organisms in ecosystems. Through investigations and models, students find that energy flow through an ecosystem is unidirectional. Students learn that the decrease in energy as it progresses through an ecosystem is mirrored by a decrease in biomass as it, too, progresses through an ecosystem. Students also discover that the amount of light energy that initially enters the ecosystem through photosynthesis ultimately determines the amount of energy available to the remaining levels of the ecosystem. Students explore the efficiency of energy transfer between levels of an ecosystem by comparing oxygen use by a live herbivore and a dead herbivore. They discover that one of the main reasons energy transfer between ecosystem levels is inefficient is that organisms must use some of the energy they consume to live. Therefore, not all of the energy that is consumed by an animal or created by a plant is stored as biomass and cannot be passed on to the next level of the ecosystem. 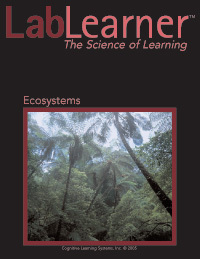 Students then create and compare two ecosystem models to investigate how the amount of plant biomass in an ecosystem determines the number of organisms each level of an ecosystem can support and that organism numbers decrease significantly as higher levels of the ecosystem are reached. Students discover that the plant biomass in an ecosystem determines the number of levels an ecosystem can support. Through this series of investigations students come to understand that ecosystems are dependent upon the producer level to capture and store adequate energy to support the upper levels of the ecosystem. Students also come to understand that energy transfer between levels must be inefficient if life is to be supported in each level. Students learn that the number of levels in each ecosystem as well as the number of animals in each level is dictated by the amount of energy that can be captured and stored by the producer level. Discover that energy flow and nutrient cycles adhere to the Laws of Conservation of Matter and Energy. Use a dilution curve as a model for energy flow through an ecosystem. Discover that energy flow through an ecosystem is unidirectional, regardless of its path through the ecosystem. Find that the amount of energy in a trophic level is directly related to the amount of biomass in that trophic level. Learn that energy transfer between trophic levels is not efficient. Discover that the amount of light energy that reaches the Earth from the Sun determines the amount of biomass that can be formed at each trophic level.